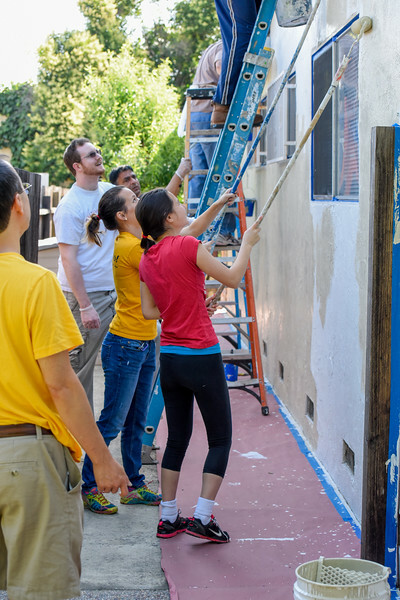 SARATOGA, California — On Sunday, June 5, 2016, more than forty-five Jews, Christians and Muslims volunteered together in East San Jose, California to paint the home of a neighbor in need. Jointly sponsored and organized by Congregation Beth David, Saratoga Federated Church, and West Valley Muslim Association, the AAi event was done in collaboration with Habitat for Humanity East Bay/Silicon Valley’s Home Repair Program, helping to preserve the dream of homeownership while revitalizing the community. Volunteer orientation was led by Mr. Hasnat Ashiq and Taj Noori of West Valley Muslim Association, Rev. Arvin Engelson of Saratoga Federated Church, Carol Cassell of Congregation Beth David, Tori Bommarito of Habitat for Humanity East Bay/Silicon Valley Faith Partnerships, and Jennifer Hannan of Habitat for Humanity EBSV Home Repair Program. Volunteers broke into small buddy groups to get acquainted. Lively discussions soon surrounded the home before volunteers began painting together. Before dining together at lunch break, leaders from each community blessed the name of God in Hebrew, English and Arabic. As the finishing touches of paint were being applied, the elderly homeowner made her way around the house to thank dozens of volunteers, marveling at God’s blessing. Several volunteers expressed deep gratitude for the privilege of seeing their congregations collaborate together for the glory of God. Special thanks to event coordinators Carol Cassell, Bryan McDonald, and Taj Noori. Photos courtesy of Qamar Noori, Chris Cassell, and Bryan McDonald. Photo curator: Nathan Flohr.